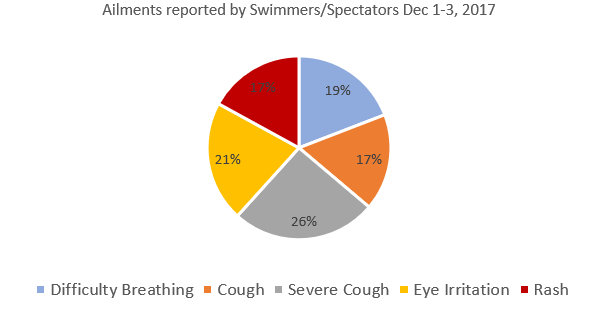 Swimmers, coaches and spectators have remarked about the air quality at several recent swim meets in our region and ailments (e.g., rashes, coughing, etc.) that have resulted from those conditions. So below is some background and useful resources for those interested. Poor air quality within indoor swimming venues has been a topic of conversation for many years. 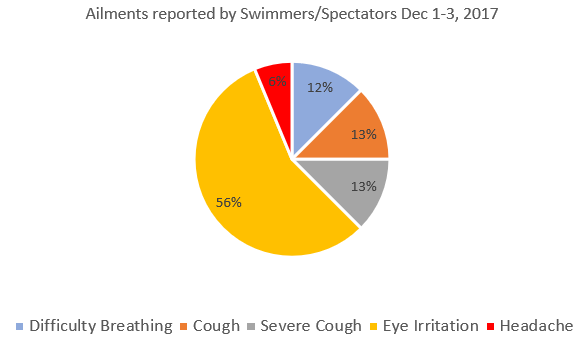 For example, athletes have voiced their discomfort with the air quality at the Greensboro Aquatic Center (GAC), a facility that has hosted National Championship meets in 2013 and 2014, and SwimSwam ran several articles on the subject (see e.g., here and here). Air quality problems at the GAC were caused by heavy usage of the pools and agitation of the water and chloramines that create off-gases. Physical reactions ranged from mild to severe, with some swimmers experiencing a sore throat, itchy eyes and even skin rashes. It took an investment of more than $350,000 to implement a solution, and since 2014, GAC has annually held the YMCA National meet (current contract ends 2017), and countless other regional, NCAA and USA Swimming- sanctioned events, bringing in tens of millions of dollars to the Greensboro community in hotel and commercial spending. According to Susan Braman, manager of GAC, the air quality problem at Greensboro came to a head in 2012. “We hosted the YMCA Nationals in April 2012. So, that was the first time we recognized that we had a problem. The problem was when we had a meet of that magnitude, had that many swimmers for that many days and that many hours each day. With the YMCA, there are easily 1,800 swimmers, several hundred coaches [and] a couple of thousand spectators, with a full day of warm-ups. It’s a five-day event”. Pools use chlorine as a disinfectant for the water. When the chlorine in the pool reacts with organic material (e.g., sweat, body oil, hair, or urine), it produces chloramines. The more the water is churned (think warm ups), the more chloramines are produced. Chloramines formed in the water then go off in a gas that settles just above the water surface. The problem isn’t the chlorine, but what chlorine turns into when combined with organics. The organics are contributed by bathers in the pool in the form of sweat, dander, urine and other organics. The chlorine reacts with the organics and produces nitrogen trichloride, aldehydes, halogenated hydrocarbons, chloroform, trihalomethanes and chloramines. The Centers for Disease Control and Prevention (CDC) confirms that chloramines cause irritation in the eyes, skin and respiratory tract issues. To reduce the risk of illness, the CDC recommends that indoor water facilities maintain good ventilation systems and that pool workers and swimmers swiftly report health issues. USA Swimming has produced a 20 minute presentation, narrated by Mick Nelson that delves into the problem of water and air quality in our pools, covering the systems that are used to filter, as well as the chemical solutions that are used to treat the water in the pools. Most of the swim meets in our area pass without a concern for air quality. At some recent meets, however, swimmers, coaches and spectators remarked about the issues they had during and after the meet. These ailments ranged from rashes, runny noses and itchy eyes to more serious issues such as chronic coughing and severe respiratory issues that resulted in physician and hospital visits. 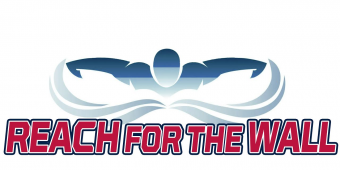 After hearing chatter in the stands and complaints from our own swimmers of eye irritation, rashes and coughs, RFTW inquired via Twitter and Facebook whether these were isolated experiences or more widespread. Unfortunately the incidents were not isolated. As set forth below, both swimmers and parents complained about breathing difficulties, asthma-like attacks, fully body rashes, and (most commonly) eye irritation. Moving bad air around the facility at more CFM’s (Cubic Feet per Minute) only negatively affects more people. Large fans in doorways blowing air from outdoors may seem to help at deck level but at water level the chloramines are still evaporating across the swimmers breathing area. Exhausting more air through vents or the HVAC system is always advisable but inefficient if we still have bad air at water level. Gimmicky air filters won’t work – that is treating the smoke not putting out the fire. Air filters won’t take out all of the chloramines regardless of their marketing claims. Good quality indoor pool air is not magic; it is a process depending on a variety of factors. Whose responsibility is a safe, healthy venue? A safe, healthy venue is EVERYONE’S RESPONSIBILITY! The facility has to have the right equipment installed and it has to be properly maintained. For example, all indoor pools need to have Medium Pressure UV units installed in the filter room, which need to be properly sized for each pool and the bulbs need to be at full strength and checked to make sure they are functioning. The meet host needs to ask the right questions pre-meet. For example, before the meet (i.e., 10 days to 2 weeks before a large meet), the facility and meet host needs to make sure the meet pool has had no recent air quality issues and that they know their HVAC equipment has been recently inspected and properly maintained. Also pre-meet, make sure the pool logs for water quality have been properly filled out. Water quality problems rarely happen overnight (except with 500+ swimmers using pool all the same day). The CPO (Certified Pool Operator) should NOT shock the pool before or during the meet. This accelerates the formation of chloramines regardless of published information to the contrary. The athletes need to take showers before entering the pool. In Europe, for example, swimmers generally must shower before entering the pool, but in the U.S., this requirement often is ignored. Swimmers need to be advised to use the bathrooms and not pee in the pool. This has to be reinforced by their coaches. It only takes 10 swimmers peeing in a 6 lane 25 yard pool to adversely affect the water quality (and therefore the air quality). The UV system can only treat the water when it travels through the filter room once every 6 hours. Chloramines can form in the pool from swimmers not taking showers or not using bathroom in less than 30 minutes. The coaches need to educate (and support) their athletes on proper behavior in accordance with heath codes. Similarly, parents of age group swimmers need to constantly reinforce healthy athlete behavior. Swimmers not properly showering before entering pool. There are over 70 chemicals in lotions and deodorants and shampoo/conditioners and makeup (etc) that combine with chlorine to form chloramines. People using the pool rather than getting out and going to the restroom. Residues from ammonia based cleaning products that are used on decks or in shower rooms/lavatories. Residues from fertilizers used on landscaping (nitrogen based) that get tracked into building on everyone’s shoes. Poor air circulation and lack of fresh air introduction into the pool building. Overuse of “shocking” the pool for maintenance purposes. 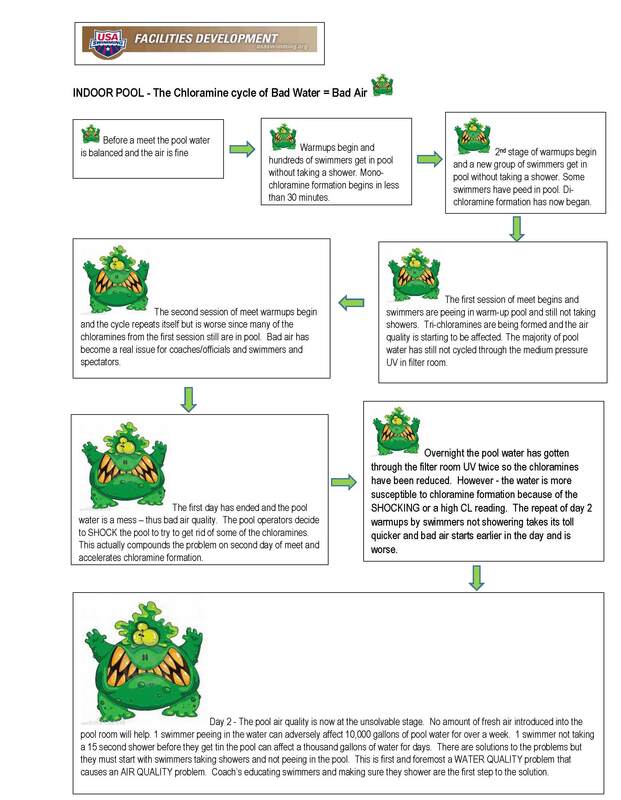 Shocking the pool before or during a meet can form chloramines. Never shock the pool unless there is a proven bacteria problem. Improper use of certain brands of chemicals not suitable for conditions specific to a geographic area. Pool filters not performing at peak efficiency. Many facilities have upgraded their pool-water filters to Regenerative DE filters which are 10 time more effective and efficient than sand filters. Pools being overloaded with more swimmers than the facility was designed and rated to handle. The last thing anyone wants is for a meet to be delayed or cancelled and the facility closed by the Department of Public Health. That is what will happen if there is a health risk from chloramines. There is a 3-part water test that will tell the concentration of chloramines vs free chlorine. Every commercial pool is required to have one of these test kits and to log the test results three times a day minimum – usually more often during a swim meet. This isn’t a guessing game – the problem can be identified and proven in less than 90 seconds. It just can’t be solved quickly so prevention is the key. Paddock Evacuators. George Villareal, a former pool operator at Jenks Aquatic Center (JAC) in Jenks, Oklahoma, indicated that JAC installed a Paddock Evacuator as part of the pool itself. To provide evidence of financial responsibility so that USA Swimming clubs can conduct insured activities. When covered injuries result in treatment by a legally qualified physician beginning within 90 days of the accident, the medical expense incurred in excess of the medical deductible, if any, will be paid, but benefits will not exceed a maximum of $25,000. Benefits must be medically necessary and cannot exceed the usual and customary charges in the geographic area where treatment is performed. Only covered medical expenses incurred by the insured within 52 weeks from the date of the accident are covered. To file a claim, send a completed Report of Occurrence form and verification of the injured party’s USA Swimming membership to the USA Swimming National Headquarters and Risk Management Services, Inc. Once received, USA Swimming National Headquarters will send a confirmation email and claim forms are sent to the injured party, or the party’s parents if a minor. All bills must be submitted to any group hospital/medical and/or HMO coverage for which the member is eligible. Copies of any Explanation of Benefits (paid or denied) documents from an individual or group hospital/medical and/or HMO coverage must accompany all itemized bills. The insurance coverage may require that no person admits liability or responsibility or discusses any aspect of an incident with anyone other than an authorized insurance company claims representative of USA Swimming, law enforcement authorities or emergency medical personnel. This is a thorough, well crafted post that I will be sure to pass on to others within the swimming and aquatic recreation industry. It is unfortunate that the most effective, least expensive method to provide for clear air in heavily used natatoriums is not mentioned. I am glad to say that the solution to chloramine control and poor indoor air quality is actually right under your nose. Please contact me and I’ll explain.